Ruby/Sapphire WOOPER usually lives in water. However, it occasionally comes out onto land in search of food. 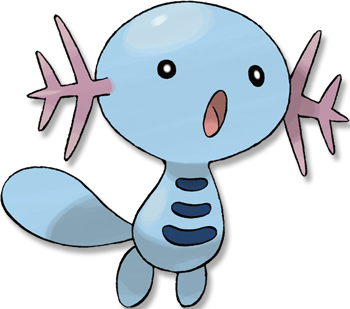 Emerald WOOPER usually live in water but come out onto land seeking food occasionally. On land, they coat their bodies with a gooey, toxic film. Leaf Green This POK�MON lives in cold water. It will leave the water to search for food when it gets cold outside. Diamond/Pearl When the temperature cools in the evening, they emerge from water to seek food along the shore. Platinum When walking on land, it covers its body with a poisonous film that keeps its skin from dehydrating. Heart Gold This Pok�mon lives in cold water. It will leave the water to search for food when it gets cold outside. Soul Silver When it walks around on the ground, it coats its body with a slimy, poisonous film. Black When walking on land, it covers its body with a poisonous film that keeps its skin from dehydrating. White When walking on land, it covers its body with a poisonous film that keeps its skin from dehydrating.